aka - Anis, Aniseed, Sweet Cumin, Sweet Fennel, Tut-te See-Hau (native American), Yan kok (Chinese), Saunf (Indian). Methods of use - as essence, essential oil, tincture, extract, powdered, tea, tablet, capsule. Origins - Anise is native to the Middle East and eastern Mediterranean. Description - Anise is an annual plant, which grows about 18 inches to 2 feet high. It has feathery leaves, the lower leaves are broad, toothed and triangular with upper leaves that are smaller, divided and narrow. It has umbrella-like clusters of dainty, creamy-white flowers and thin roots. The seeds are grey-green to brownish, ribbed and ovate, measuring 2 -4 mm (.08 -.16 in) long they have the flavor of licorice and the aroma of sweet fennel. Attributed medicinal qualities - It is said to help with digestion and to sweeten the breath, so it is chewed after meals in parts of Europe, the Middle East and India. It is a mild expectorant, anise often being used in cough mixtures and lozenges. It is also antiseptic, antispasmodic, soporific and a few seeds taken with water will often cure hiccoughs. It is said to promote estrogen production and is used to encourage breast milk, ease childbirth, and stimulate the libido. Anise should not be confused with Star Anise (Illicium verum) - used in production of Roche's drug Tamiflu (Oseltamivir Phosphate) - which is said to reduce the severity of avian flu. History - The early Arabic name was anysum from which was derived the Greek anison and the Latin anisun. It is one of the oldest known spice plants used both for culinary and medicinal purposes since ancient times. Anise's carminative properties have been known since antiquity. There is evidence that anise was used in Egypt as early as 1500 B.C and it was well known to the Greeks, being mentioned by Dioscorides and Pliny and was cultivated in Tuscany in Roman times. In the Middle Ages its cultivation spread to Central Europe. Cultivation - Anise can be grown from seed. It is a slow-growing, annual plant and requires a sunny, warm , sheltered location with deep, well fed, light soil. Sow the seeds directly, where they are to grow (it dislikes being transplanted), on a warm day in April or May. When the seedlings come up, thin them out to 6 to 12 inches apart and keep the area weed free. If they are planted too late and hot weather sets in, the plants will be lanky and small, and will bloom and produce seeds too quickly. The plant should flower about 3 months after planting (July), and if successful the seeds will ripen a month after flowering. Harvesting, preparation and storage - As the seeds change colour to grey-green cut the whole plant to the ground. Hang the cut plants upside down, in a dry place, with a paper bag over the heads to collect the seeds (the bag will catch the dry seeds as they fall). Keep the seeds in their paper bags and allow them to dry in a well-ventilated place. The seeds quickly lose their flavour, so keep them whole and grind them as required, keep them out of light in an airtight container. Kept in an airtight container it should retain its flavour for at least 2 years. Culinary Uses - In Europe anise is used to flavour cakes, biscuits and confectionery, as well as rye breads. In the Middle East and India it is mostly used in breads and savoury foods. 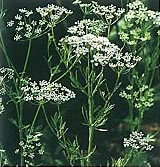 It is also used in much the same way as fennel to flavour fish, poultry, soups and root vegetable dishes. A recipe for Anise biscuits here. The young leaves can be used in salads or as a garnish for vegetable dishes/soups. Magical Uses - Anise seeds are a herb of protection said to avert all evil. In ancient Roman times, they were baked into a cake that was served at the end of the wedding feast. Used also for purification, protection, to entice spirits to aid in spells of divination and psychic awareness. In a pillow it is said to ward off nightmares. A charm against nightmares here. Anise is the true taste of licorice— its oils are distilled into the flavouring for licorice sweets. Numerous alcoholic drinks and cordials are flavoured with anise, particularly French pastis , Pernod and Ricard, Greek ouzo , Spanish ojen , Turkish raki , Italian anesone , Arab arrak and Egyptian kibib. The seeds can be used roasted as a breath sweetener. Dogs are said to be attracted by anise — it is often an ingredient in dog food and the seeds may be used to lay drag hunt trails and also by anti-blood sport movements to put hounds off the scent. As an effective bait for rats and mice. As a lure for fish.